Welcome to our online part show. selecting from the four categories below. Fifty Years Of Experience: We have been creating the highest quality, custom molded, rubber, LSR, and silicone products for almost fifty years. This allows us to create the best products and provide the fastest complete silicone services from proto to production. We offer an extremely wide range of services to create any custom part that you need. 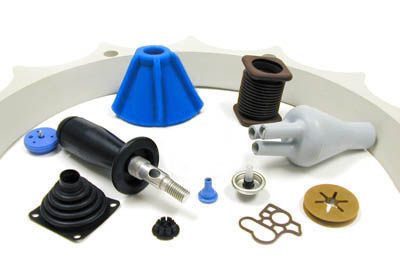 We can provide custom molds, custom tooling, overmolded parts, custom rubber and silicone and custom silicone or rubber to metal bonded parts, and countless other products. Our in-house team of mold designers, engineers, chemists, and custom compound mixers all work together to ensure that you receive the highest quality pieces to match your application. We can create the perfect custom rubber or silicone for any application that you can think of with our thousands of custom compounds. We produce parts made of polyurethane, butyl, flourosilicone, nitrile, natural rubber, and countless other compounds. When you get your custom tooling made by us, we provide an unmatched level of quality. Other services create their prototypes from cheap aluminum with a short lifespan. We only use 4130 and 4140 steel to create your prototypes. 4130 steel has a long lifespan and provides reliable productivity for the entire duration of its lifespan. By purchasing your prototypes from us, you save yourself money, time, and effort. Don't buy cheap prototypes and have to spend more to replace them. Buy our 4130 steel prototypes and enjoy the reliability of real tools. At Rubber Industries, we continuously provide our services to the world's biggest industries. We supply the biggest brands in the automotive, industrial, medical, and even consumer industries. We produce custom molded parts that are used in situations where accuracy and reliability are key. Our seals, gaskets, diaphragms, o-rings, bellows, and more are used in such critical environments as hospitals and medical supplies. They're trusted in automotive use, industrial equipment, and even in your everyday household. We have partners in Asia to help us produce very competitively priced tools and pieces by the millions every year. On top of that, we have the largest tooling and tremendous scale in our custom rubber and silicone injection molding in the industry on our five acre, USA based, property. Between our own in-house shop and our Asian partners, we have the scale to match any size project and amounts of product in a dramatically reduced amount of time compared to our competitors. Not only are we the fastest custom molder and production tooling company, but we stand out amongst the rest by only using 4130 or 4140 steel to create our prototypes so your tooling will last for the life of your project, not just temporary tooling like others.